When I write for New Politics, I tag my blogs with key words. I wonder how many other Left publications include "teachers unions" under "labor" or include "education" as a separate topic and run critical analyses—as we do? I explain in this just-out piece in Jacobin why the Red state teacher walkouts cannot be understood without noting how teaching as work and teachers as workers have been overlooked. The work they/we do is in education. It's a story about women's work and school reforms that have aimed to destroy the profession, globally. The story pushes against the mold of labor struggles in which union officials speak for workers and of national boundaries. If you like this article, please share it. 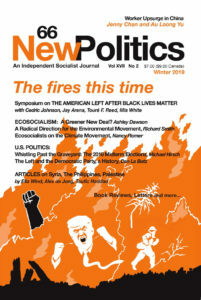 And subscribe and donate to New Politics, which has consistently published critical work on education and teachers unions for a broader Left audience. LOIS WEINER is an independent researcher and consultant on teacher union transformation. She is a member of the New Politics editorial board.